The Institute received $45,000 in seed grand funding support from the Gary and Mary West Foundation to present to five academic faculty award winners. An esteemed committee of judges comprised of researchers, academic faculty and palliative care experts reviewed more than 20 proposals, all with the purpose of advancing research and innovations to improve care and enhance quality of life for seniors and family caregivers. The five selected grant awardees will carry out their research projects over the next year and present their findings at the 2018 Symposium. 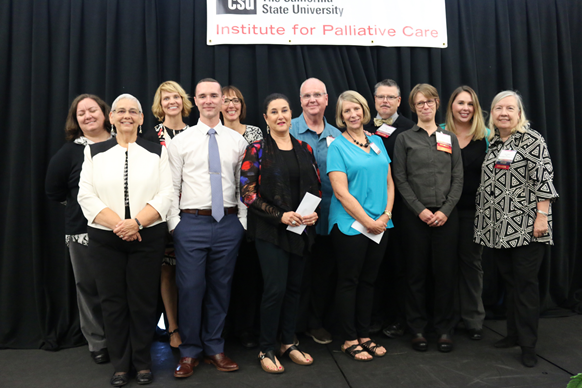 Hosted by the California State University Institute for Palliative Care in Southern California, September 28 – 29, the symposium brought together 180 faculty from institutions across the U.S. who teach and conduct research in the field of palliative care and related areas. The symposium was designed to bring colleagues together to connect and collaborate and launch much-needed research efforts to advance this discipline. The recipients were part of a nationwide call for research proposals to faculty involved in palliative care education and research projects that improve care and enhance quality of life for seniors and family caregivers. Submission topics ranged from home- and community-based palliative care; aging-in-place; frailty; addressing multiple chronic conditions; stress management and shared-decision making for seniors; and broader dissemination of palliative care services for older adults. To achieve the transformation necessary for palliative care to become the standard practice across the healthcare system, faculty and researchers need to engage and educate the next generation of clinical and academic professionals. Faculty members interested in or engaged in palliative care education and research are invited to learn more about the 2018 Symposium by visiting csupalliativecare.org/symposium. For further information, call the CSU Institute for Palliative Care at 760-750-4006. The California State University Institute for Palliative Care is dedicated to increasing access to and awareness of palliative care by educating current and future professionals as well as community members. It offers palliative care-focused professional development and continuing education courses that are enhancing the skills of current and future healthcare professionals across the country and around the world. Housed within the largest university system in the United States, the Institute is dedicated to ensuring the trained palliative care workforce needed to meet the growing number of chronically or seriously ill people in all care settings, today and tomorrow.